The 2014 season has been open for a few days … our first guests arrived, the works coming to an end and we’re ready to welcome you. This year we have done a lot of work to improve the comfort of our customers and try to respond to some comments left in the reviews. Thanks to your opinion and a score of 8.9 / 10 we were classified by Zoover 2Oth best campsite in France! After comfort, we will also make this year a little more friendliness. As soon July until the end of August a welcome drink will be offered every Sunday. It allow us to present you the camping, his services, his entertainment … In this regard, every Thursday evening, a musical evening or a themed meal will be organized while respecting the peace and quiet that many of you come in search here since we will end the evening at the latest 23h. Without forgetting the retransmission of certain matches of the World Cup Soccer June 12 to July 13 and the steps of the Tour de France from July 5 to July 27. 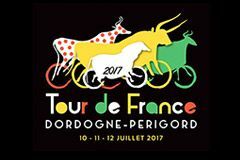 You can even live online as the 20th step Saturday, July 26, the day before the arrival, this year taking place in Dordogne with Périgueux-Bergerac against the clock, these cities are located around forty kilometers from the campsite. 2014 promises to be an eventful season!